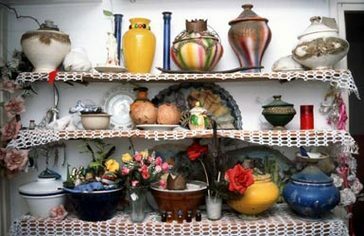 The Orichas are kept on an altar in a Cuban home. Outsiders sometimes call Santería or Regla de Ocha a "primitive" or "esoteric" religion. In reality, it's neither. The Yoruba people, who are the ancestors of the Lucumí religion, had a highly civilized kingdom in Africa with a rich culture. They were great philosophers with a profound sense of ethics, which carried over into the Regla de Ocha. There is no unified body of written work we can refer to as the sacred text of the Lucumi religion because it was transmitted from generation to generation by priests and priestesses as part of an oral tradition. Nevertheless, within this oral tradition there are many patakies, or sacred stories that serve as parables, and many proverbs that embody the teachings of the religion. These survive in oral form in the present day as a system of reference for practitioners of Santería, and new priests and priestesses memorize and study them as part of their religious training. While some aspects of Santería are kept secret from outsiders because they represent sacred knowledge, in no way is the religion esoteric, or limited to the understanding of a select few. For the millions of people initiated in the religion, the principles of Santería aren't difficult to grasp. In many ways, it's a practical religion that aims to help individuals live more in harmony with themselves and the world around them. The concept of aché, or the spiritual energy present in the universe, is central to most Lucumí practices. Practitioners hope to acquire more aché and maintain it through ethical behavior and attention to spiritual matters, which allows them to live good lives and evolve as human beings. A misconception about Santería is that it's a polytheistic religion, or one that worships many gods. This isn't strictly true. There is one supreme God in the Lucumí pantheon, who like the Holy Trinity of the Catholic Church, has three representations and three names: Olodumare, Olofi, and Olorun. Olodumare is the Supreme Being, the Father, the Creator of all things in the universe. Olorun is another manifestation of God, visible to us as the Sun. Through the warmth and life-giving qualities of the Sun, we can experience the world that Olodumare created for us. Olorun is the owner of Heaven, known as Orun. Olofi is the third manifestion of God. He is the one who communicates most directly with the Orichas, teaching them what humans need to know to lead healthful, moral, respectful lives on Earth. The Orichas act as intermediaries between human beings and God. They watch over humans and report our actions to Olofi. They have aché, spiritual energy given to them by Olofi, which they use to maintain harmony and righteousness in the world. Most of the Orichas at one time had human form and gained semi-divine status after death, similar to the way many people think about Catholic saints. Santeros and Santeras undergo a ceremony to find out which Oricha "owns their head." This means that they identify as the son or daughter of that Oricha, with whom they have an especially close relationship. Practioners of Santería are devoted to the Orichas and worship them, but they are never placed above Olodumare. While official figures are hard to find, it's commonly believed that between 75 and 100 million people in the world practice some form of Santería today. It's one of the fastest growing religions in urban areas of the United States, especially cities with large African American and Latino poulations. In Cuba, statistics suggest that as much as 80% of the population has some connection to Santería. Globally, people of all races, socio-economic backgrounds and educational levels practice the Lucumi religion. It proudly holds on to its Afro-Cuban roots, but it's no longer limited to people with ethnic ties to Latin America and Africa.